Persons From Porlock | "Northern Crossings"
Coleridge claimed that “Kubla Khan” a great epic came to him whole and entire in sleep. As he feverishly wrote it down and sought to finish it whole and entire in one sitting he was distracted by a “person from Porlock” who came to sell him something. The distraction meant that his epic turned into 54 lines of unfinished imagination. The person from Porlock has come to mean any distraction that causes disruption of true work being done. 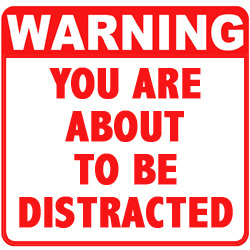 Distractions are things that take our mind away from more important things, or something that needs to be focused on. We hear a lot about distracted driving, distracted boating, and none of it is good. I’m told all the time that I am either A. so focused on one thing that I block out everything else especially my wife’s voice, or B – that I am so distracted but I don’t get anything done I just meander from one thing to the other. Once again, either way, it is not good. There have been scientific papers written over distractions, and how it might be a sign of mental illness. Now there is a book out that is basically a big distraction, called “A Higher Loyalty” by James Comey. It is a bit distracting to find out the kinds of things that distracted the highest law enforcement official in the land. Hand size, tie length, goggle marks from a tanning bed, and hair style are just a few. Comey didn’t have one person from Porlock, it sounds as if a whole crowd of them live in his head, a kind of cheering section for narcissism. The cheering section bellows “thank God you are not like this fellow, this temporary office holder with strange hair and goggle marks and lengthly ties” and he is so distracted he forgets little bits of important business that the chief law inforcement officer in the land should remember, like telling the Chief Executive that the information that has him in trouble was paid for by political hit people, some of whom infest the FBI. Supposedly there is some stuff in this book about truth and lies and leadership, but every excerpt that I have read summons up my own “person of Porlock” who distracts me with the question of how someone like this got to be the head of the FBI in the first place? The other distraction is what higher authority gives him the pull to judge anyone else’s quirks or mannerism or anything else. Next time – did God have a “person from Porlock”? NextDid God Have a Person From Porlock? Notes on Preaching 2 – Witness, Mercy, Life Together – What Ranks Higher? Walther on the church and the poor.